Leaving Positano is a sad thought, but knowing we must go back to Rome for our long journey home, we began on our adventure on the road back home. The overcast makes the hills of Positano dreamy-like. The winding roads took us to one of the world’s most beautiful places, in my humble opinion: Furore, Italy and Furore Beach. Well, actually, it isn’t even Furore, but it is on the highway SS163 winding along the coast looking toward Furore. You have to get out of your car at the bridge and look down to the cove below to get a glimpse of Furore, Italy and Furore Beach. Oddly enough, another couple had pulled over their car too, at the same exact time and all four of us stood there in awe, almost speechless. For the life of me, I cannot remember their names or where they were from, only our conversation about being blessed in this very moment of getting to see one of God’s most beautiful creations, Furore Beach. I longingly asked myself if only I could have one more day here… I pleaded with my God. 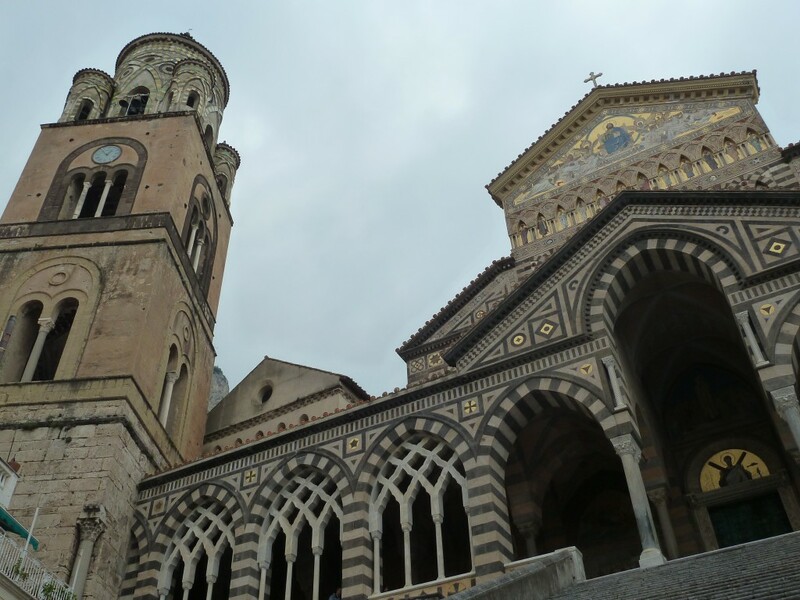 “Could he give me just one more day to experience this place?” Of course, the answer was “no” and after only 15 minutes or so, we were back in our little rented Fiat and on the road to Ravello. Stuck in time, the mention of Furore, Italy will always bring a smile to my face and remind me of the moment that I saw the most beautiful place on earth. 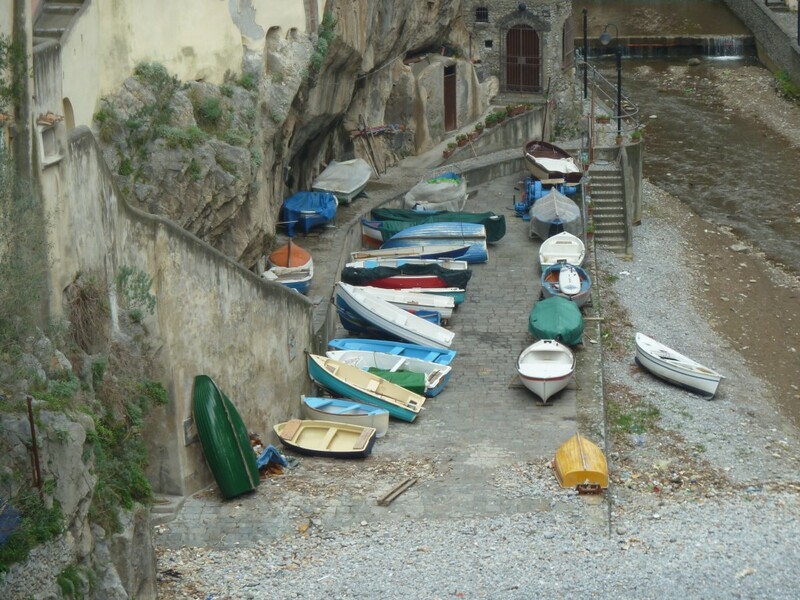 Furore is a small Italian village located along the Coast of Amalfi. 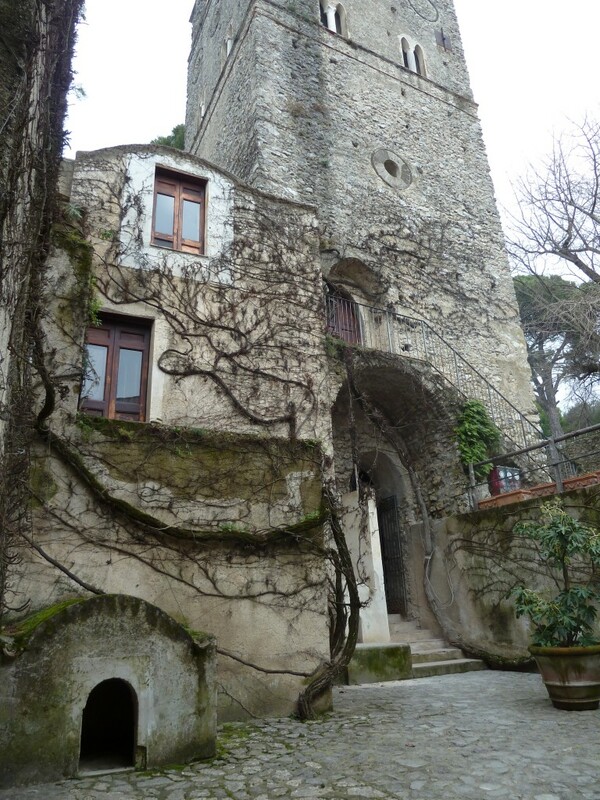 It is in the province of Salerno in the southwest region known as Campania. 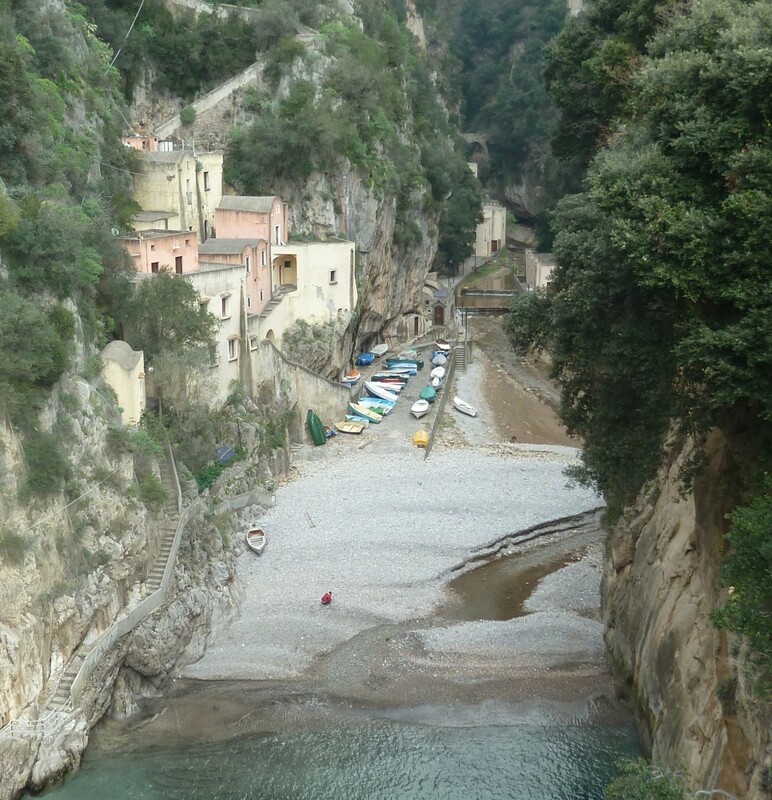 Since Furore was so hidden deep in the gorge or Fjord, many named Furore, “the village that doesn’t exist.” This gorge cuts straight into the rock, bringing a narrow strip of the sea to a tiny sandy beach. The town itself has no piazza or town square and so many pass it by. But the mayor of the village decided it was high time to get noticed by the tourists, so he asked every homeowner to paint their house bright colors so that they couldn’t escape from the view of the travelers passing by. This tradition is still maintained today. Now they invite artists from around the world to paint the local buildings with murals. A small cluster of fisherman houses clings to the side of the cliff. The townspeople here are primarily are either fisherman or winery owners and many of them are both! From the town, it takes 944 steps to make it down to that sandy Furore beach, known as the Marina di Furore, which is Italy’s only Fjord! If you are adventurous, you can walk across the bridge that connects the two sides of the fjord, then dive about 100 feet from the bridge into the crystal clear water (NOT!). But this is where the Mediterranean Club High Dive Championship occurs every year in July! 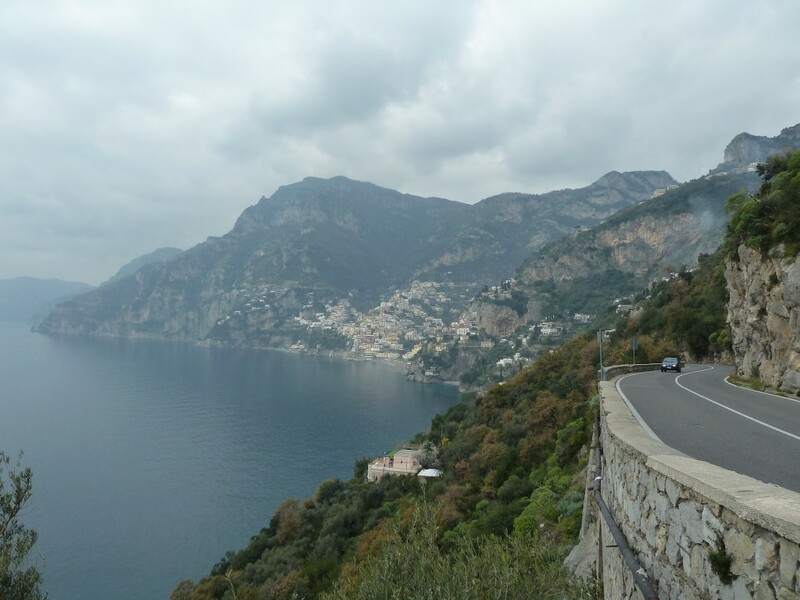 Leaving Furore, Italy, we traveled down the SS143, around the curves and winding roads and came upon Amalfi, the most famous town along the route. 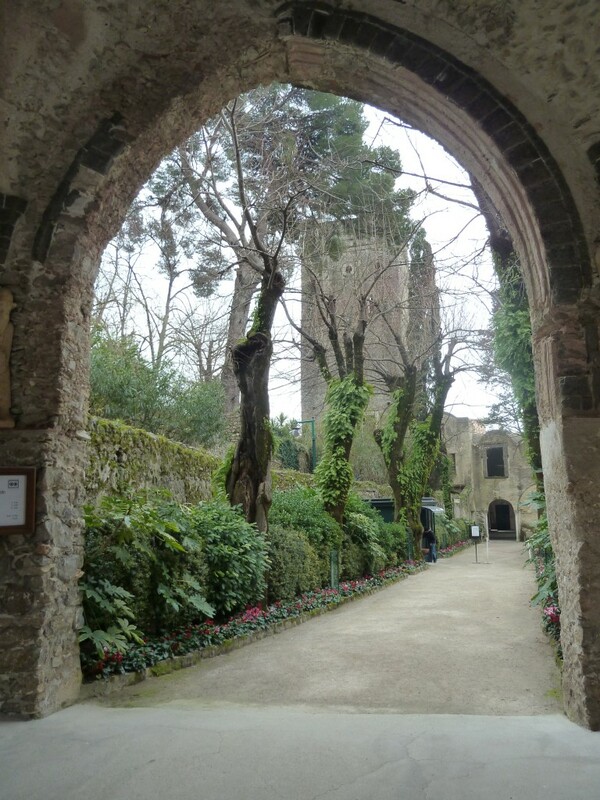 We quickly tucked the car into a convenient spot and got out to take a peek at the town square and the local church. 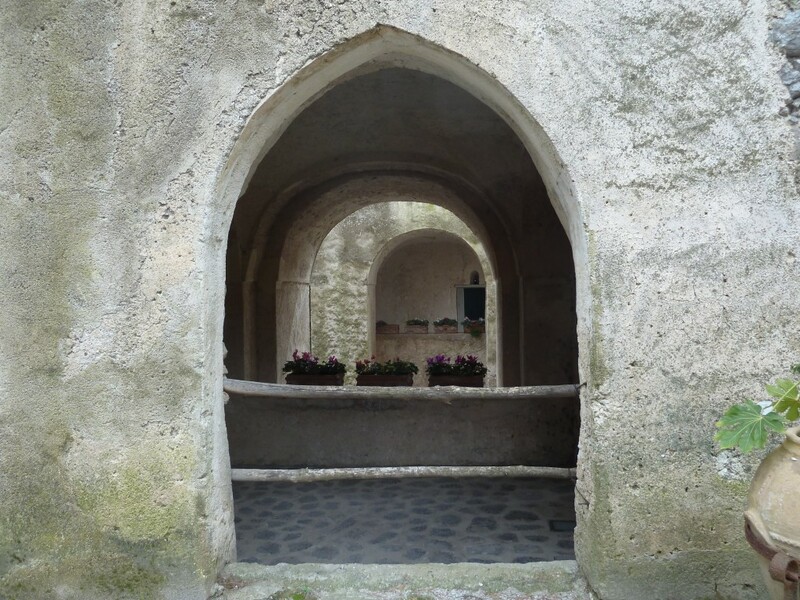 And then there is Ravello. A local recommended it to us one night as we were having dinner. We still had some time before we had to be in Rome and thought it would make a great pit stop (just a little out of the way). Wow! Were we surprised at what beauty was coming our way! 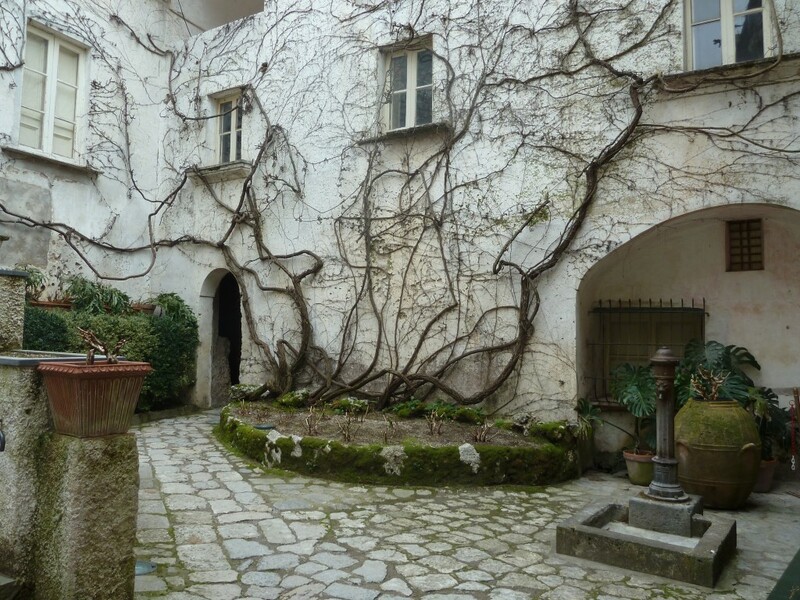 Villa Rufolo: Pay the 5 Euros to get in and explore all the nooks and crannies of this magnificent villa and its grounds. Get your camera fully charged for an outstanding visit. Don’t forget the bottom garden where you can take lovely pictures facing the sea. This wonderfully restored villa has hidden pockets of enchanting things. Around every corner is something more beautiful than what you saw around the last. It’s definitely worth a visit. Go to Italy’s Amalfi Coast. You will not be disappointed. We didn’t make it to Amalfi this time around but it is high on my list. I’ve been going to a restaurant in New York called Posa Posa since I was young. It’s inspired by Positano. When I had braces, it was my reward meal for dealing going to the orthodontist. Now I’m hungry! @Neil, yes I loved, loved, loved Positano and the Amalfi Coast. I just wished I had more time to explore the area. In less than 10 days, I will be off to explore the Cinque Terre region of Italy. It will be great to compare the two areas and see what the differences are in the regions. We will be in Florence for 5 nights next month and I was hoping to take the train for a day trip to Cinque Terre. That will have to do this time around. Will follow your trip report ! 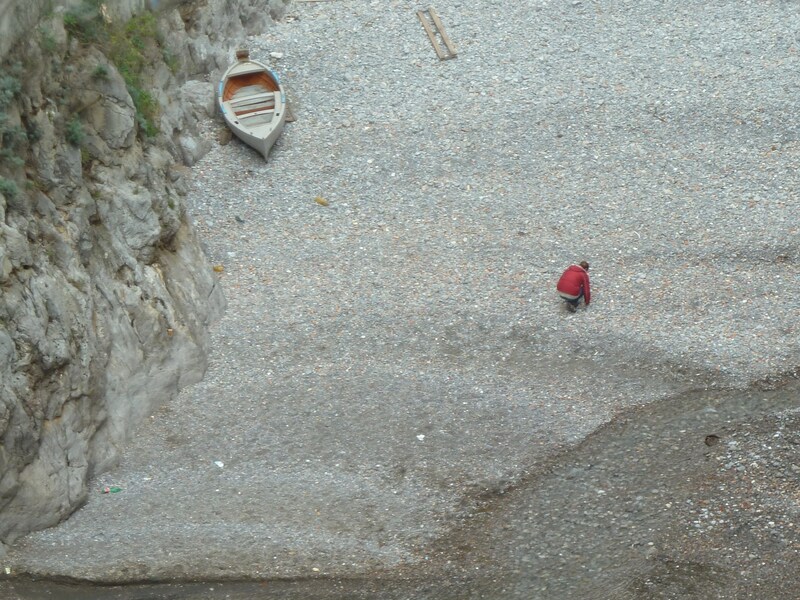 I have only taken quick trips to the Cinque Terre and my upcoming trip will be the same. But I can vouch for the beauty and wonderment of the Amalfi Coast! There is nothing quite like it! 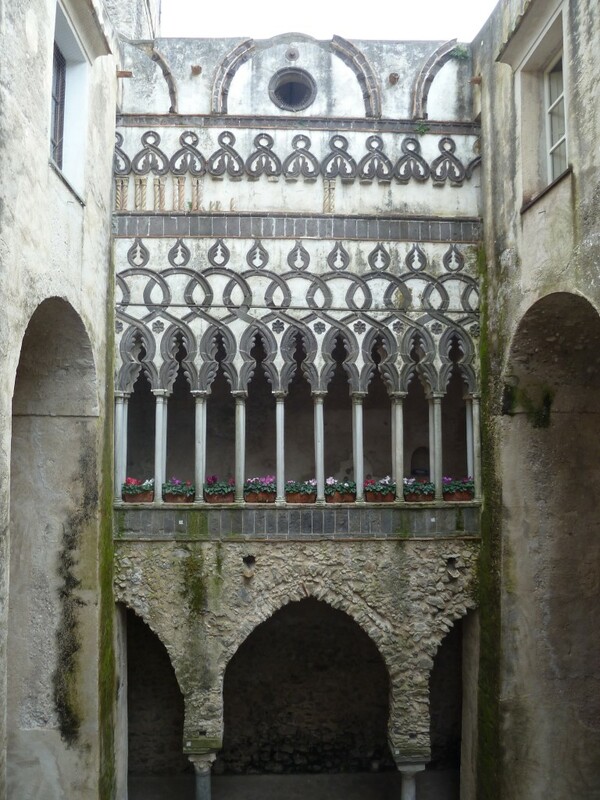 There are so many places to visit in Italy and all of them are beautiful with some amazing history. Although I have never been there but have read a lot about it. Hopefully I will be able to visit there in my next vacation. I love Italy, there are so many wonderful places in Italy. I love your blog and photos. We plan a trip to Furore next summer! Oh, you will love it there! 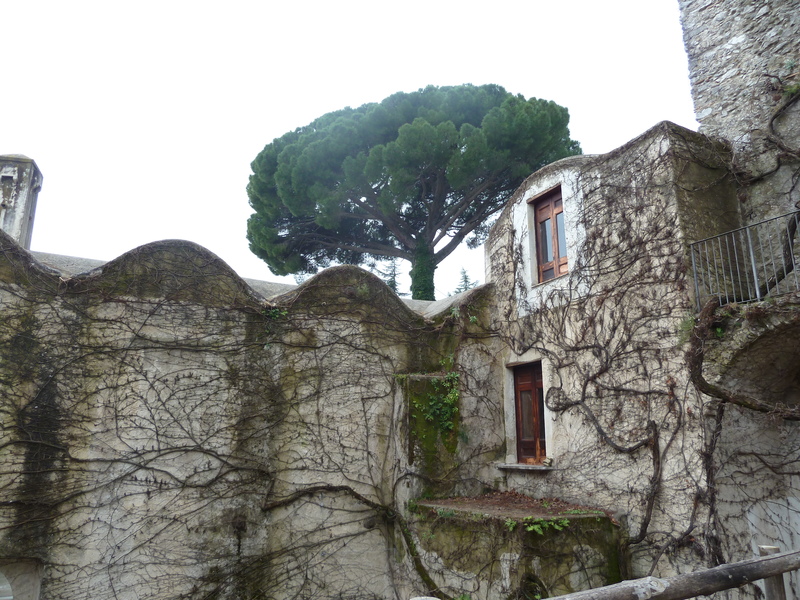 I love the trees growing up the sides of those buildings in Ravello! Those look amazing! Why couldn’t you stay in Furore longer? It would have been awesome to have dinner there and converse with the locals over wine I bet. I had those experiences in Spain..these little hidden villages lost in time but with friendly locals willing to tell you stories of their towns! I am glad you found that even for a minute! Eric, I know right? 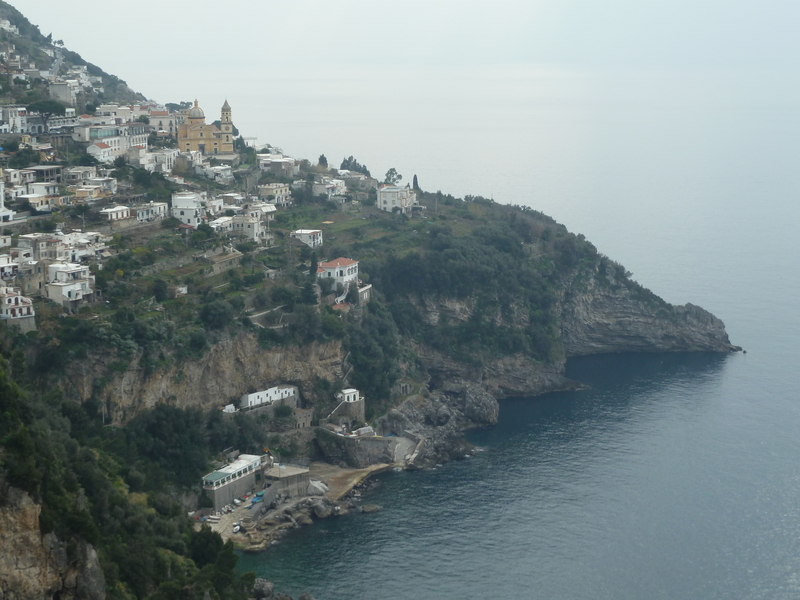 We were driving back from the Amalfi Coast to Rome to catch a flight, so I had to go… but will make it back there again some time and converse with locals over wine!